In June, DC Comics finally got a winner with the release of Wonder Woman. The Gal Gadot-led superhero flick brought Diana Prince to life in a way we haven’t seen on the big screen in a long time. She showed off some girl power in more ways than one, and her suit looked like the coolest set of armor this side of Themyscira. With the upcoming release of Justice League setting the stage for another appearance for her on the big screen, she’s set up to kill it once again. 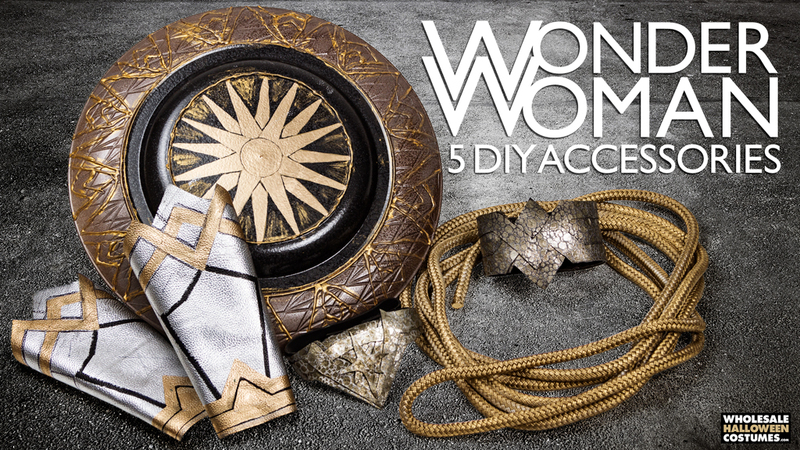 Wonder Woman costumes are sure to be a super popular choice for a Halloween this year, so if you’re going to tackle the Diana of Themyscira look, you’ll need to stand out. That’s why Wholesale Halloween Costumes put together this simple and easy to do DIY to take your costume to the next level! Wonder Woman is always accompanied with her shield, the Lasso of Truth, Bracelets of Submisison, her tiara and her armband. 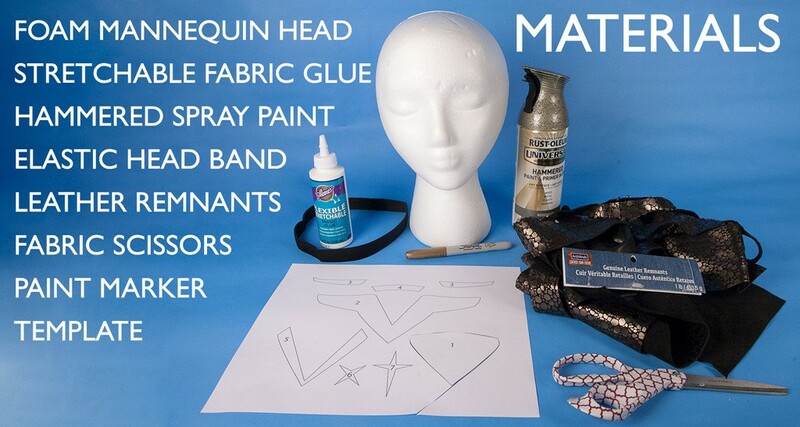 So make sure your look matches hers on the battlefield with these five DIY costume accessories! Step 1. 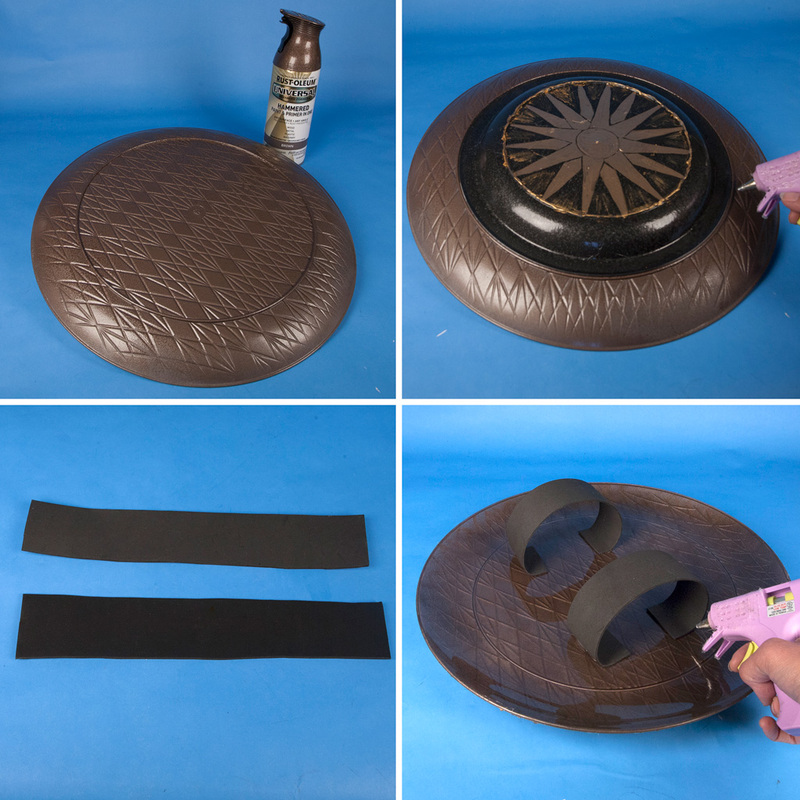 Spray paint the bottom of the 10” plate with the hammered black paint. Step 2. Cut out the template pieces. 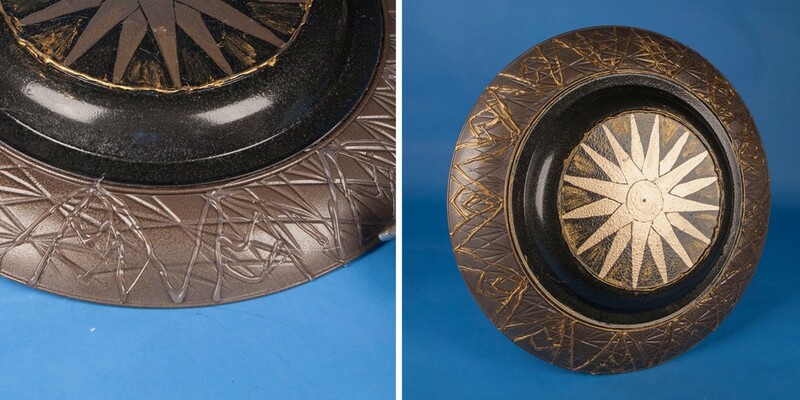 Trace the circle in the middle of the plate using the paint marker. Use the triangle template to trace the first ray on the shield. Step 3. Trace 3 more rays on opposite sides of the circle, as shown. Step 4. Trace a second set of rays, in between the first set. Step 5. Trace a third set of rays between the second set, for a total of 16 evenly spaced rays. Step 6. Paint the circle with the gold enamel. Step 7. Finish painting each of the rays with the gold enamel, leaving small areas of black between the rays to keep them separate. Step 8. With the hot glue gun, add a strip of glue in a circle around the rays. Step 9. Apply the metallic lustre to the dried hot glue with a cotton swab. Step 10. Use the cotton swab to rub the metallic lustre into the glue. You can add some streaks of the metallic lustre around the rays. Step 11. 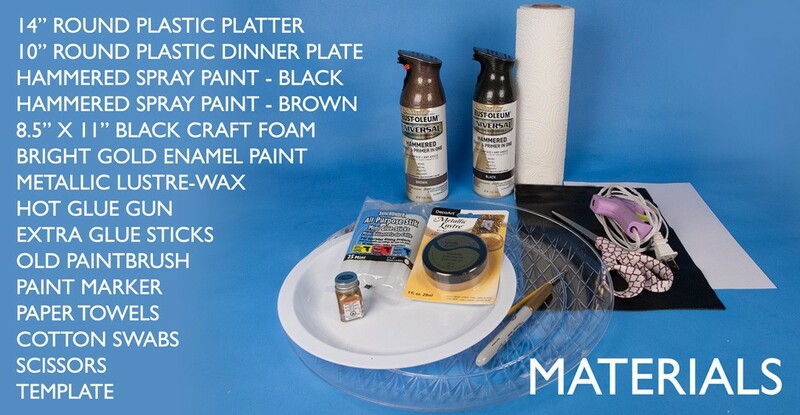 Spray paint the bottom of the 14” platter with the hammered brown paint, let dry. Step 12. Hot glue the small plate to the middle of the large plate. Step 13. Cut 2 strips of black foam to make armbands for the shield. Step 14. Measure the strips so that when folded over, they fit the arm of the person using the shield. 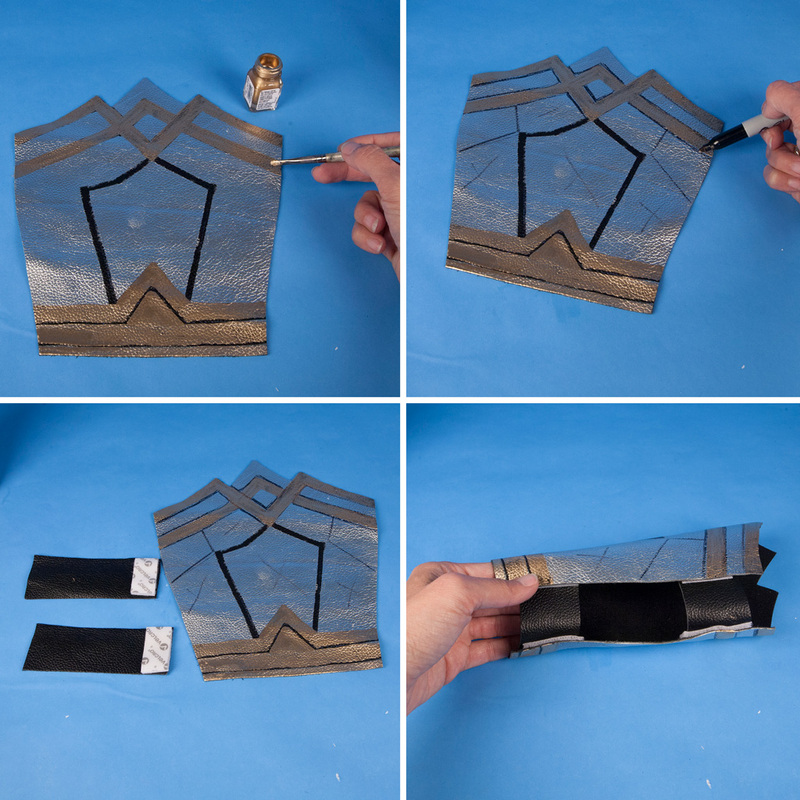 Fold the foam strips and hot glue the ends to the back of the shield, creating the armbands. Step 15. 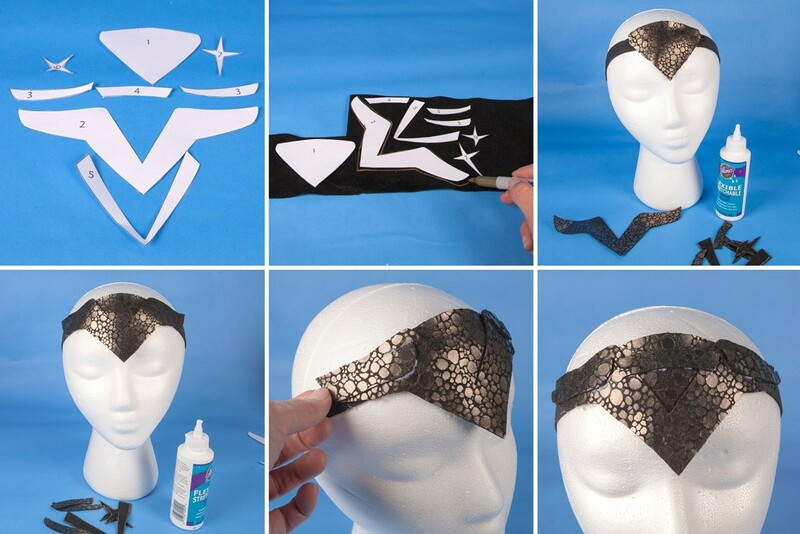 Make triangular designs around the outer edge of the shield using the hot glue gun. Step 16. 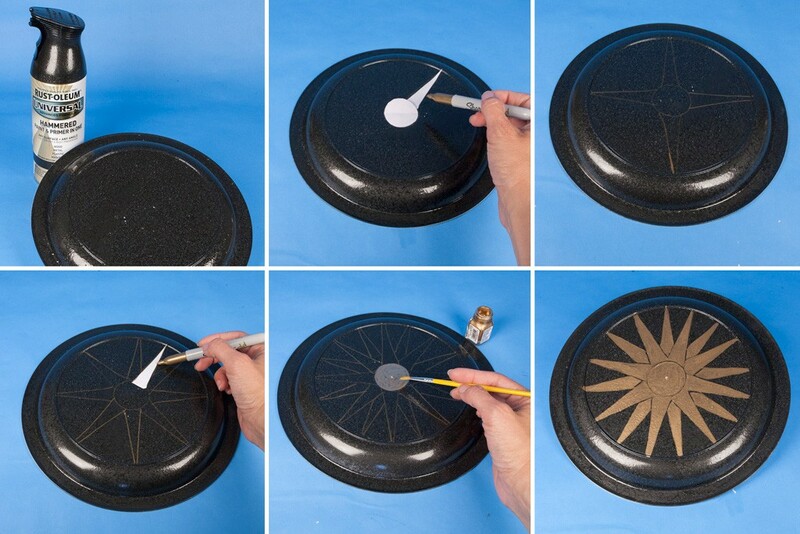 Finish the shield by applying the metallic lustre to the hot glue designs. The shield is fairly easy to make and looks like a movie prop. Step 1. 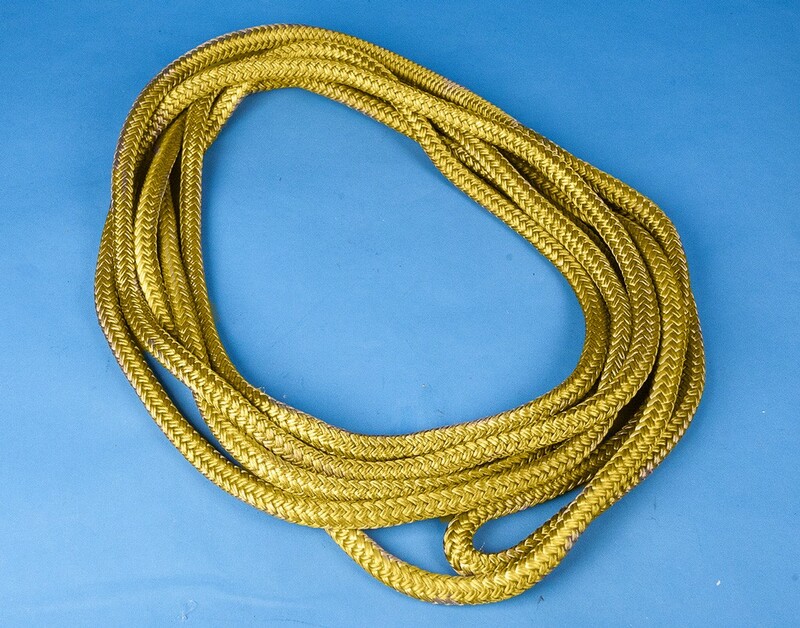 Spray paint the rope in a well-ventilated area. Use newspaper or cardboard to protect the ground while spraying. Allow it to dry for at least 8 hours. Step 1. Cut out the template, as shown. Step 2. Gently tape the top edge of the template to the sheet of leather. Place a piece of transfer paper between the template and the leather, making sure that the darker side of the transfer paper is face down on the leather. Trace the outside of the template, and all the inner lines using a ballpoint pen. Press hard as you trace, and lift the template occasionally to check that the lines are transferring to the leather. Step 3. When you are done tracing, the gauntlet should be transferred to the leather. Cut out the gauntlet. Step 4. 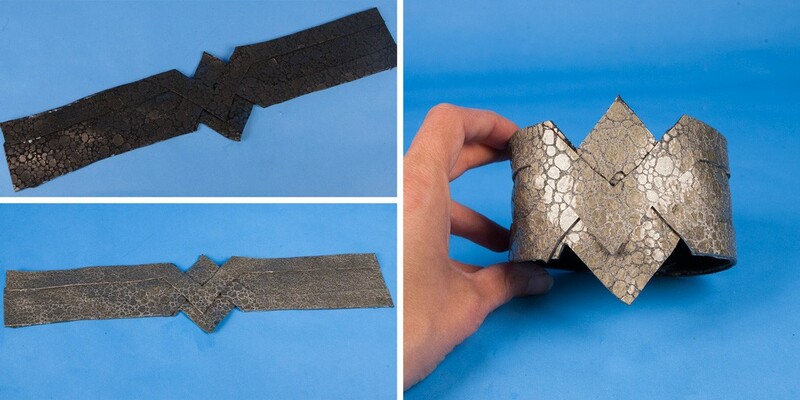 Tear thin strips of duct tape, and tape them to the gauntlet, following the template lines, as shown. 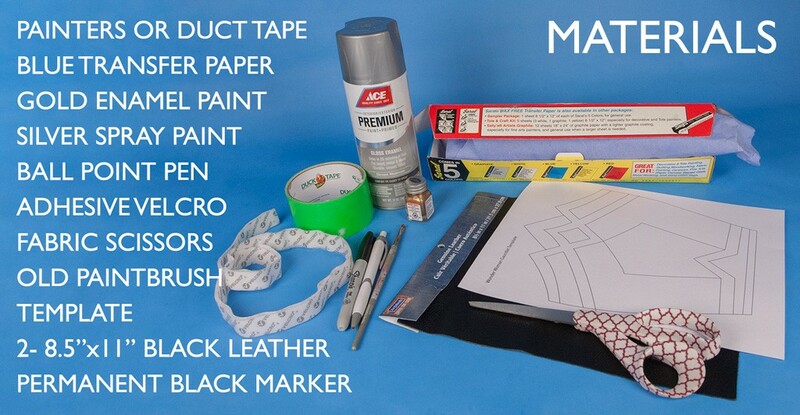 The duct tape will “mask” the leather and protect it from the spray paint. Step 5. Spray paint the gauntlet silver and let dry. Step 6. Gently pull the tape off the gauntlet, exposing the unpainted black leather. Step 7. 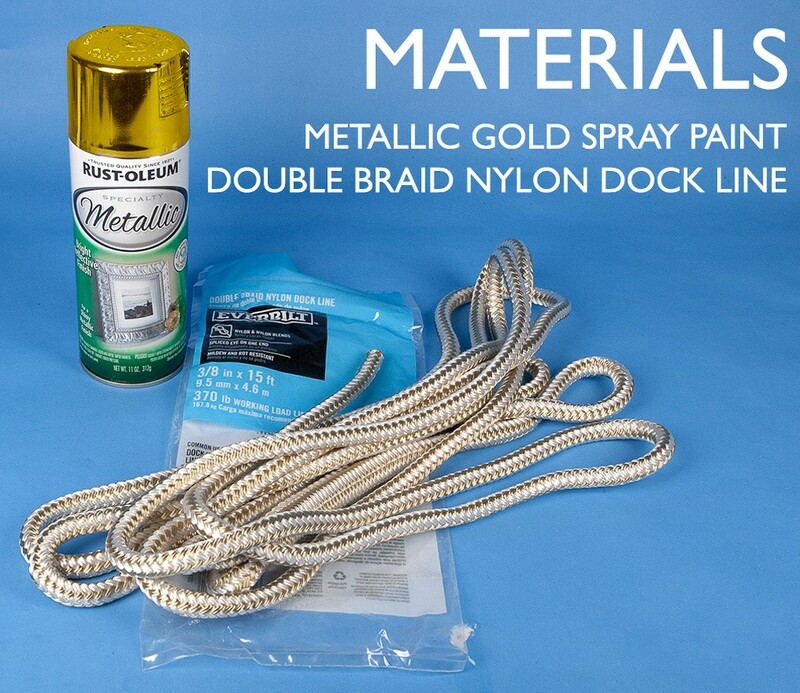 Paint the top and bottom lines with the gold epoxy. Leave the thin black lines unpainted. Step 8. Let the epoxy dry to the touch. Then outline the gold areas with the black permanent marker. Add a few more black lines to accent the gauntlet and show possible battle damage. Step 9. Using the scraps of leftover leather, cut two strips that will be used to make straps for the gauntlet. Apply the adhesive Velcro to one edge of each strap. Step 10. Size the gauntlet to fit your arm. Attach the Velcro to the gauntlet and straps on both sides and trim off any extra leather. Step 11. The gauntlet is complete and ready to wear. The leather is both durable, and flexible. Repeat the process to create the second gauntlet. Step 1. Cut out each piece of the template. The template pieces are number in the order that the final pieces will be glued together. Step 2. Using the paint marker, trace the template pieces on the back of leather remnants. Cut out the pieces with the fabric scissors. Step 3. Place the headband on the mannequin. It’s important to use the mannequin head to keep the headband stretched out while the leather pieces are glued and drying. Glue piece #1 to the headband, as shown. Make sure not to glue the leather to the mannequin. Step 4. Apply Piece #2 to the headband, as shown. Making sure to apply glue only to the leather and headband. Step 5. There are two #3 pieces, glue one to each side of the headband. Step 6. Glue piece #4 across the front of the headband. Step 7. Apply piece #5 (Shaped like a V) to the headband. Step 8. Finally glue pieces #6 and #7 to create the star in the middle of the headband. Let the glue dry 24 hrs before removing the headband from the mannequin. Step 9. 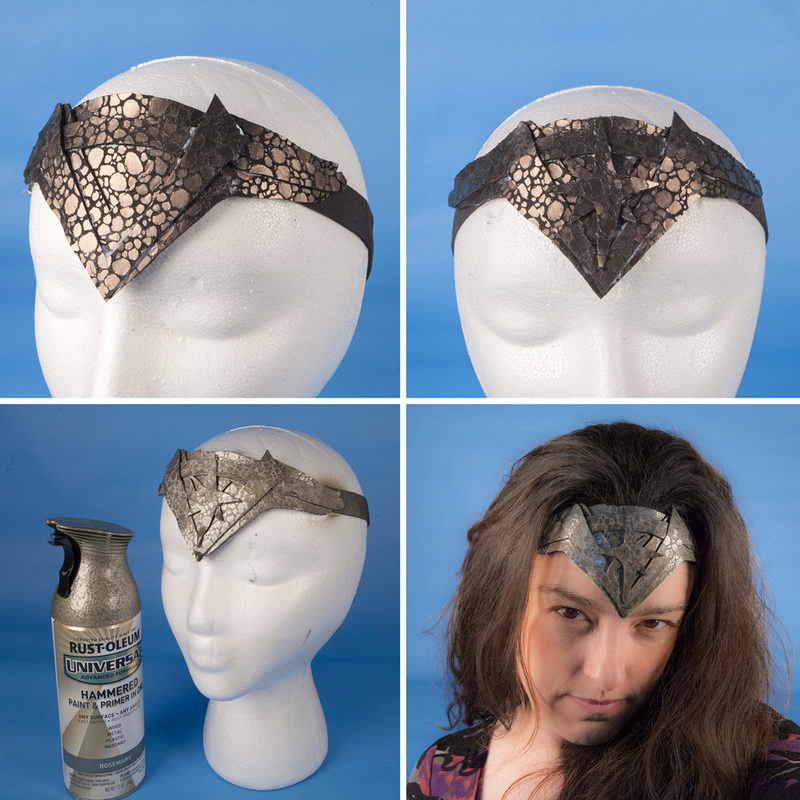 Spray the final headband with the Rustoleum Hammered spray paint and let dry. Step 10. The head band is ready! Wear it with your own hair, or get a wonder woman-esqe wig. Step 1. Cut out each piece of the template. The template pieces are number in the order that the final pieces will be glued together. Using the paint marker, trace the template pieces on the back of leather remnants. Adjust the length of the pieces so that the band will wrap entirely around your bicep, with enough left to adhere the ends together with Velcro. Step 2. Cut out the 3 leather pieces with the fabric scissors. Step 3. Using the stretchable fabric glue, attach piece #2 on top of piece #1, as shown. Step 4. Glue piece #3 on top of the pieces #1 and #2. Step 5. 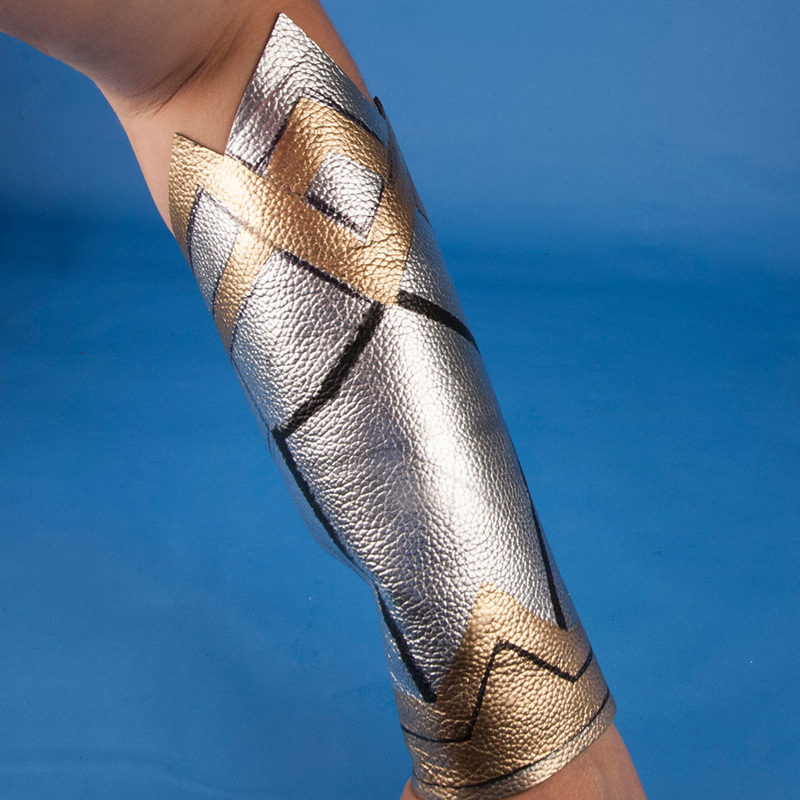 Spray paint the armband with the Rustoluem hammered paint, and let dry. Step 6. 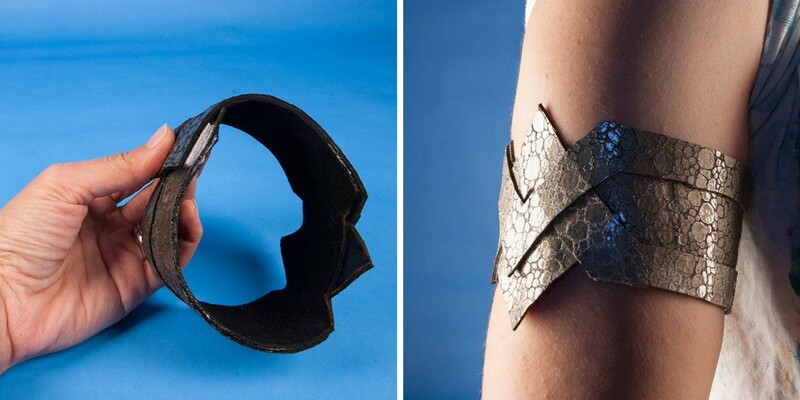 Attach the adhesive Velcro strips to the armband. Step 7. The arm band is complete. Pair it with the matching headband to complete your Wonder Woman costume. For more superhero stuff, costume accessories, and makeup tutorials follow Wholesale Halloween Costumes on Facebook, Twitter, and Instagram!